Thank-Scrip-ing Day is coming on November 20, and you can earn big just in time for your holiday shopping. Get ready to earn bonus rebates on all the eGift cards (ScripNow®️) and reloads to your physical gift cards you need for Black Friday and Cyber Monday during the one-day event. 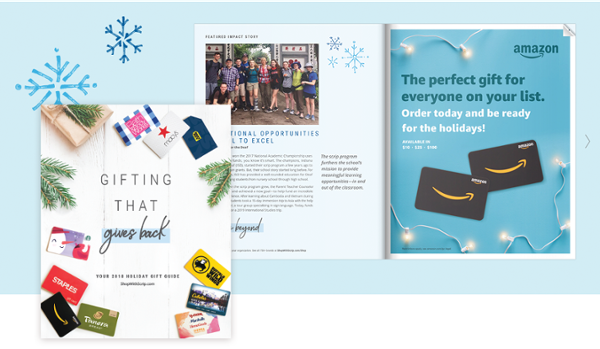 Earn even more this holiday season when you shop and share the holiday gift guide. With over 750 top brands to choose from, it’s simple to find the perfect gift for everyone on your list. The more people who order, the merrier—be sure to share the giftspiration with family and friends. Holiday gift card wrappers are now available to order. Packaging up a limited-time low denomination gift card in a holiday wrapper makes the perfect present or stocking stuffer. Order Bath & Body Works scrip for all your home fragrance, hand soap, or gift-giving needs and help your organization receive free shipping. Today through November 16, your organization will receive free shipping on any method when the organization order includes at least $150 of Bath & Body Works scrip.